STORRS, Conn. -- Jubilant fans celebrating UConn's Monday night national basketball championship win smashed a window in an engineering building, broke street lights and overturned furniture inside the school's student union. CBS Hartford, Conn. affiliate WFSB-TV says damage was reported throughout the UConn campus. School officials said a few small small fires were also set on campus, the station reports. UConn police had made 30 arrests by 1:30 a.m. Tuesday, while state police had made others and more were expected, said University of Connecticut spokesman Tom Breen. "A lot of it was alcohol-related," Breen said. "There was breech of peace, destruction of property, and we had a fireworks charge." No serious injuries had been reported. "By far, most of our students have conducted themselves safely and responsibly," UConn Police Chief Barbara O'Connor said. 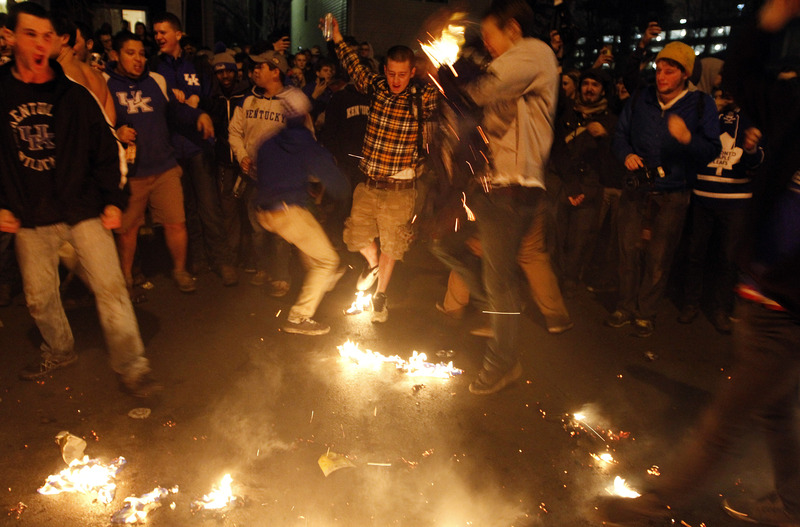 The mood was more subdued in Lexington, Ky., after the Wildcats' loss. CBS Lexington affiliate WKYT-TV reports many fans who filled local bars quietly headed home after the game. There were fires and arrests on State Street after the contest, though there weren't as many fans gathered there compared to Saturday night, when Kentucky beat Wisconsin to advance to Monday night's championship game. According to officials, as of early Tuesday, there had been 17 couch fires, 15 trash fires and 14 injuries. WKYT says there was a report of one person being hit by a train and taken to a hospital. More than 10,000 UConn students shook the stands during a viewing party in the Gampel Pavilion, erupted in cheers and stormed the arena floor as the Huskies beat Kentucky 60-54 in the NCAA title game, giving the program its fourth national championship and second in four years. "I'm just so happy to be a Husky right now," said Mike Butkus, a 21-year-old senior from Naugatuck. "So much pride. The last 20 years, you'd be hard-pressed to find a program more successful than us." Students waited in line for up to four hours to get a seat inside the arena just to watch on three large movie screens as their team played 1,700 miles away in Arlington, Texas. The arena was filled a half-hour after the doors opened, and hundreds more fans were turned away. "It's my first year of college, you've got to go big," said Ryan Massicotte, an 18-year-old freshman from Naugatuck who was sporting a fuzzy Husky dog hat and sunglasses with the dog logo on each lens. "You've got to show it off the right way." The students sang the national anthem, chanted "Let's go Huskies" before the tip, roared when the home team was introduced and booed the Kentucky players. The stands shook every time Shabazz Napier made a 3-pointer. The pep band and school dance team entertained the crowd during timeouts. They jumped up and down chanting "I believe that we will win" as their Huskies struggled through a second-half rally by Kentucky. A few minutes later, as the final seconds ticked off the clock in Texas, they pushed their way on the floor, turning it into a giant mosh pit as their belief became a reality. After the victory, the students went outside onto a plaza for a dance party in the rain. The school hired a disc jockey in an effort to keep crowds of students under control. As many danced, others were hanging from trees and light poles and throwing firecrackers. At one point, a firework exploded just above the crowd. Extra campus police and state police patrolled on and around campus and several fire companies were on standby with ambulances. Several people were helped from the arena by paramedics, apparently with alcohol-related issues. Students said they expect the party to go on into the early morning hours. "Hopefully I'll be able to go to class tomorrow, but I'm not certain," said Vincent Buffa, a 21-year-old senior from Tolland. The team planned to return to Gampel for a pep rally at 5 p.m. Tuesday, followed by another viewing party - this one for the UConn women's team. The undefeated women will be seeking a ninth national title when they play Notre Dame in Nashville. "This energy is like something I've never felt in my entire life," Ricky O'Neill, a freshman from New York, said Monday night. "And we're going to do this all again tomorrow."